Adult tricycles are great way for individuals with balance issues, or people who just enjoy the added stability of a tricycle, to enjoy open road cruising with friends and family. There are actually a surprising number of different styles of adult tricycles, which include the semi-recumbent, folding, electric, and even the chopper tricycle style. While these tricycles are sturdy and pretty high-quality, one common complaint is that they can be exceptionally difficult to assemble. We recommend having someone do it for you, perhaps a bicycle repair shop, and avoid the hassle of assembly altogether. Let's take a look at five of the best-selling adult tricycles on the market today and see how they compare. Handicapped users find that when regular bikes are not an option any longer that adult tricycles are a great alternative. Users advise to always wear a helmet when riding your adult tricycle because when you go down hills you will be going very fast. You should also ensure that your brakes are in continuously good condition. Some of the adult tricycles, especially the Komodo tricycle, are incredibly complex to piece together-and the instructions that are included are sadly insufficient to guide you. If you are having trouble constructing your tricycle, it's not a bad idea to visit a bicycle repair shop and have them do the assembly for you- there's no point in getting aggravated and perhaps misassembling your adult tricycle. Typical features of an adult tricycle include a steering system composed of a steel stand and handlebar; a comfortable saddle; front alloy brakes as well as steel rear brakes; six speed gear shifters; and 24 to 26 inch tires. The Scwinn Meridian will actually let you attach a rear child seat to it. In a nutshell a tricycle, which is often referred to as a trike, is a vehicle with three wheels. While we have written extensively here about adult tricycles, most people are familiar with tricycles as vehicles for children who require the additional stability before they move on to two wheel bicycles. 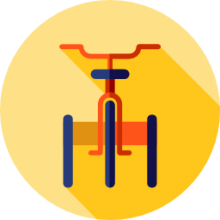 Tricycles are generally made of metal with one rubber wheel upfront and two rubber wheels in the back. Tricycles have evolved over time- there used to be many different sorts that no longer exist. There even used to be steam-powered tricycles, tricycles that were powered by hand peddling, and gas-powered tricycles that were considered motorized vehicles. Tricycles have often appeared comically as upright tricycles. Adult tricycle's for individuals with disabilities are a recent innovation that enable people are often semi-paralyzed to still enjoy the pleasures of open-road cruising. The modern design of these three-wheeled vehicles enable individuals to easily mount and dismount them, which distinguishes them from bicycles which can be difficult for elderly or disabled people to get on. They easily accommodate people with balance issues because when you stop riding the tricycle you can easily and comfortably place both feet on the ground, ensuring that you don't tip over and fall. Unsurprisingly, there are a variety of different styles of tricycle available today including the semi-recumbent tricycle, the electric tricycle, the folding tricycle the folding electric tricycle, low steps tricycle, the chopper tricycle as well as the double tricycle. When considering a tricycle to purchase check out the different styles available, may consider having it assembled for you and avoiding the painful hassle of its construction.